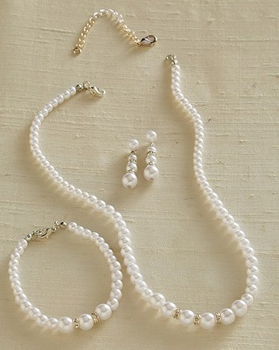 The 16 inch pearl necklace has 3 Austrian crystal accents at its focal point. Here the pearls are also slightly larger. It has a lobster clasp closure and comes with a 2 inch extender. The pearl bracelet follows the same pattern as the necklace, except it only has 2 Austrian crystal accents. It too has a lobster clasp closure. The matching pearl earrings are pierced. FWO Extra: The earrings are 1 inch long.